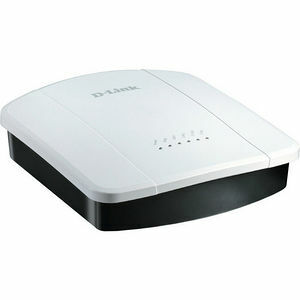 The DWL-8610AP is D-Link's next generation Unified Wireless Access Point. Intended for the small/medium enterprise market, the DWL-8610AP provides unparalleled bandwidth and flexibility for administrators looking to deploy a medium/large scale Wi-Fi network. Featuring the latest 802.11ac technology on its 5GHz band, the DWL-86100AP brings you to the forefront in cutting edge wireless technology. The DWL-8610AP provides fast and reliable connectivity by using 3x3 implementation, allowing for over 1 Gbps of throughput over the air. Beamforming technology enables the DWL-8610AP to have even greater reach than its predecessor, the DWL-86100, thereby allowing even more flexibility in any deployment scenario. Based on 3x3 802.11n technology, the DWL-8610AP provides the highest possible level of performance in the 2.4GHz band.